We’d love your help. Let us know what’s wrong with this preview of Timetrap by David Dvorkin. To ask other readers questions about Timetrap, please sign up. A different sort of Star Trek novel...but a great one! My issue with the book is that there is no action until the last fifty pages of the book, the first half all being setup that I found rather tough to find enjoyable. The setup does serve a purpose though, it's meant to trick the reader and prepare them for the big surprise at the end. But perhaps the biggest problem with this story is that the Kirk we're presented isn't one of action. Most of this book was a love story between him and a Klingon where they simply walk around a ship. It is only wit My issue with the book is that there is no action until the last fifty pages of the book, the first half all being setup that I found rather tough to find enjoyable. The setup does serve a purpose though, it's meant to trick the reader and prepare them for the big surprise at the end. But perhaps the biggest problem with this story is that the Kirk we're presented isn't one of action. Most of this book was a love story between him and a Klingon where they simply walk around a ship. It is only within the last twenty pages that we see him take charge of the mission. I'd call this a 3.5 stars to be honest. OK, it's a Star Trek novel. Given what we're basing this on, my expectations weren't real high. I expected campy. I expect that Kirk would fall in love (again), and I expected some science that would sound shaky at best. And yep, I got all that. On the other hand, I also got an entertaining read, a cross species romance that even I didn't see coming, an entire conspiracy theory (and oh, I do love a good conspiracy theory) and a deeper look into Spock's charac I'd call this a 3.5 stars to be honest. On the other hand, I also got an entertaining read, a cross species romance that even I didn't see coming, an entire conspiracy theory (and oh, I do love a good conspiracy theory) and a deeper look into Spock's character, especially as he took command of the enterprise. So yes, it was a good book. I'd recommend this for lovers of the original Star Trek series. It's a fun read for when you have some time to kill. And one that I honestly have to admit that I couldn't put down once I got into it. Take the TNG episode "Future Imperfect"...now take it back a century in Kirk's time, but make the mystery a bit more dangerous, and the writing a bit more fun. It isn't a perfect novel...and you can see the climax coming from a mile away...but it's certainly more satisfying than "Future Imperfect". During a failed attempt to rescue Klingon officers during an ion storm, Captain Kirk is lost. He finds himself one hundred years in the future, a hero of both the Federation and their greatest allies, the Klingon Empire. As an architect of this Great Peace, Kirk is asked to return to his own time to facilitate the Klingon mission to Earth. Dvorkin's mystery is fairly weak, but the adventure makes up for the shortcomings and the story holds up well enough for repeated readings. I think this was the first Star Trek novel I ever bought. I loved it and read it multiple times. May have to read it again and see if it holds up more than 20 years later. I suspect it will. though. 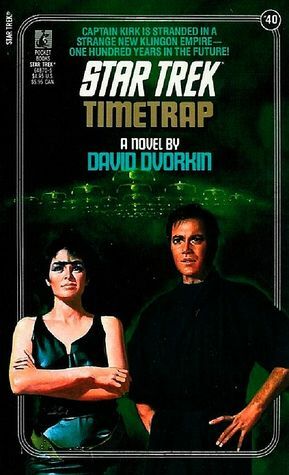 The premise of Timetrap by David Dvorkin is a slight of hand that the reader falls for from the experience of James Kirk, who himself falls for the Klingon deception. The Enterprise encounters a Klingon Bird-of-Prey in Federation territory near the Tholian space, Kirk beams over in an attempt to grab a Klingon for questioning only for the ship to disappear as the result of an interstellar storm that also affects the Enterprise. Kirk waits up among Klingons supposedly 100 years in the future duri The premise of Timetrap by David Dvorkin is a slight of hand that the reader falls for from the experience of James Kirk, who himself falls for the Klingon deception. The Enterprise encounters a Klingon Bird-of-Prey in Federation territory near the Tholian space, Kirk beams over in an attempt to grab a Klingon for questioning only for the ship to disappear as the result of an interstellar storm that also affects the Enterprise. Kirk waits up among Klingons supposedly 100 years in the future during a period called "The Great Peace" between the Federation and Klingons to learn he is the reason it occurred. However, the battered Enterprise arrives at Starbase Seventeen where Spock starts his investigation into Kirk disappearance. Events quickly transpire that sends Kirk with a Klingon fleet into Federation space, but along the way the deception starts to unravel and completely falls apart as the two hostile factions face off with one another. While the pace and overall story of the novel were good, it was the character development of Kirk that was really off putting and though at the end of the novel his behavior is hand-waved as a product of chemical manipulation it's still off putting. The internal conflict of the Klingon undercover spy is well done and completely tricks the reader when the true is revealed. Captain Kirk wakes up in his future where the Federation is in peace with the Klingons. Or does he? David Dvorkin has written an engaging political thriller with surprisingly epic proportions. He moves the story forward well, with a dynamic, well-flowing style. The plot isn't nearly as good as the form, however, with the reader being constantly ahead of the characters who really don't act- and most importantly think and deduce- the way they should. An entertaining read nonetheless. Just no! I know it's drugs, I know Kirk is hurt and all, BUT him being "oh, I won't see Spock and McCoy and Enterprise anymore, but that's ok I have a new life now with a KLINGONS" is just sickly WRONG. He is not this stupid... better skip this one. Another spin off of "City on The Edge of Forever" (Season 1 Episode 28). While I did enjoy the usual snappy dialouge and seeing the old gang in action, this plot was so slow moving I had trouble finishing it. Just another of a batch of Star Trek books I picked up from a charity shop,it was an OK premise and a quick read. Y'know what, I actually enjoyed this one quite a bit. I like Dvorkin's insights, his pov, on the characters. Nothing to add to other reviews, sorry. I read this and a few other ST books before ST:TNG. I do not remember much about the book, but I liked it. I almost got mad but hey I wasn't being patient. I had a few chuckles at familiar interactions between our beloved stars. This wasn't too bad after all. Read this when I was a teen and still enjoy it today. Like so many of the early Trek books it isn't horrible, but it isn't terribly memorable either. The time travel bit was interesting enough and I give it points for trying something a bit different. you think it is a normal time travel but be prepared it is not. Good book for the weekend or train/bus. Well played author, well played. Wanted to try a Star Trek book for some time and it was exactly how I expected. It was a fun and easy read. As a good trekkie I couldn't miss this one. It's good but the author - IMHO - didn't pick up the characters of Kirk and McCoy very well.